Through the voices and emotions of 15 prominent writers and essayists, Histories of Hope - Personal reflections on transition in the EBRD region brings together a diverse range of views on the social and economic changes that have affected their countries since the end of communism in eastern Europe and the former Soviet Union. 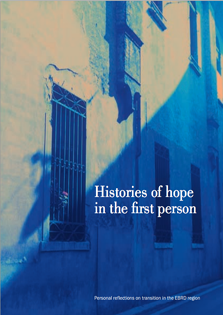 Launched on the occasion of the 2008 Annual Meeting of the EBRD in Kiev, Histories of Hope gives a sense of the colossal historic changes which have occurred across the Bank’s region of operations, particularly in Armenia, Azerbaijan, Belarus, Bulgaria, Croatia, Georgia, Kazakhstan, Kyrgyz Republic, Moldova, Russia, Serbia, Tajikistan, Turkmenistan, Ukraine and Uzbekistan. This unique collection of reflections was compiled and edited by the renowned Ukrainian author, Andrei Kurkov. Murad Aitakov, Dmitry Alyaev, Marin Bodakov, Adil Dzhalilov, Stepan Grigoryan, Arslan Koichiev, Fariz Ismailzade, Andrey Kurkov, Tatyana Montik, Simo Mraovic, Guram Odishariya, Andrei Okara, Valery Pogosyan, Mikhal Ramach, Natalia Sontu (Motili), Nargis Zokirova.